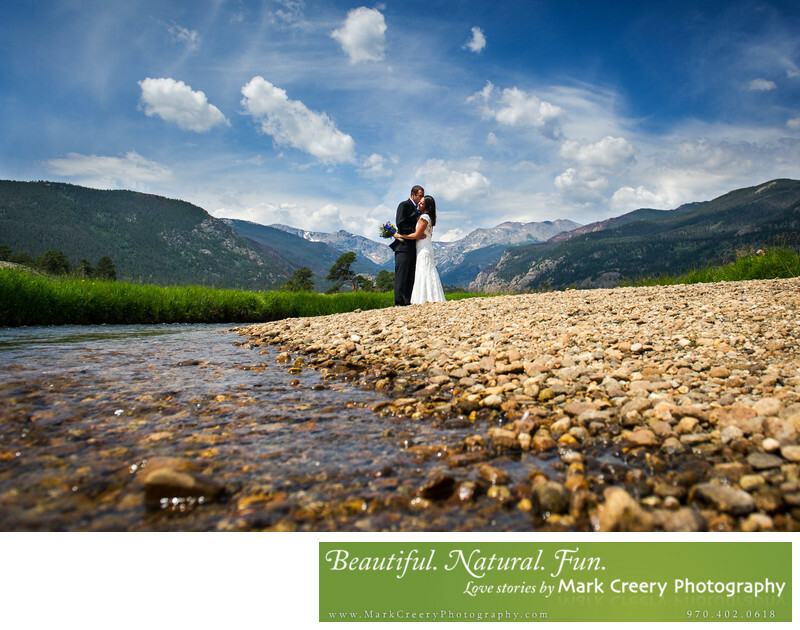 Congratulations on choosing Estes Park for your destination wedding location! If you're still considering it - don't hesitate any longer. It's an exciting place to be planning your wedding or elopement in. As a wedding photographer with intimate knowledge of the area and an eye for capturing the essence of the landscape, you can be sure I will be provide you with the best photos to remember your mountain wedding by. Check out my wedding gallery to see my natural style that is perfectly suited for the outdoors. Get in touch with me about your wedding by using my contact form. Or reach out the old fashion way at 970-402-0618. I am happy to provide personalized service for your unique event. 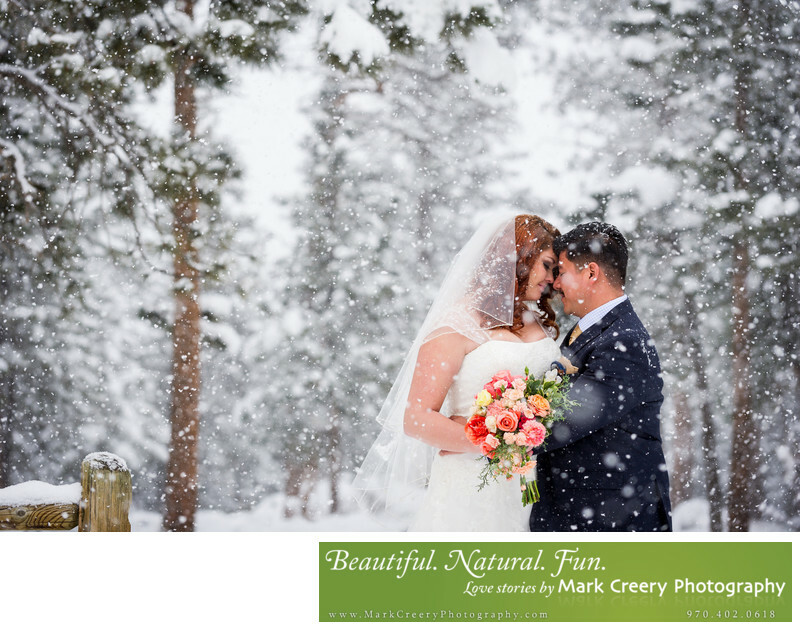 Spring can be an interesting time for a wedding in Estes Park. In the photo below, Jessica and Luis got more than they bargained for with a foot of snow on their wedding day after no snow on the ground the day before. As you can see it makes for an amazing scene if you're willing to brave the cold! 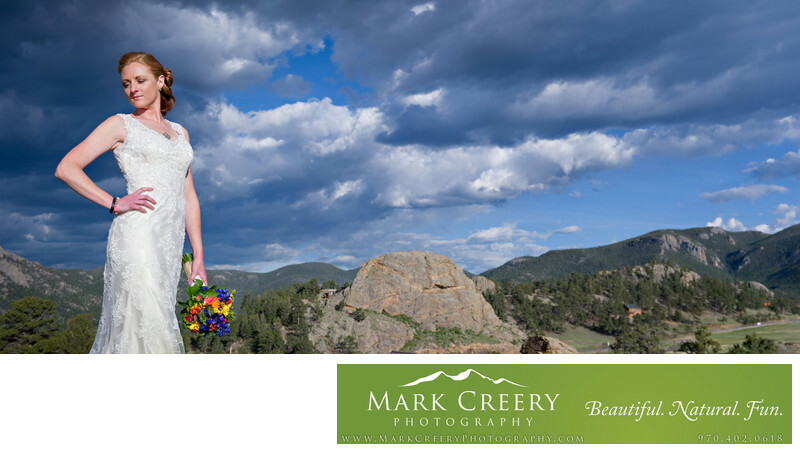 The wedding took place at the YMCA of the Rockies and the photo was taken on site. 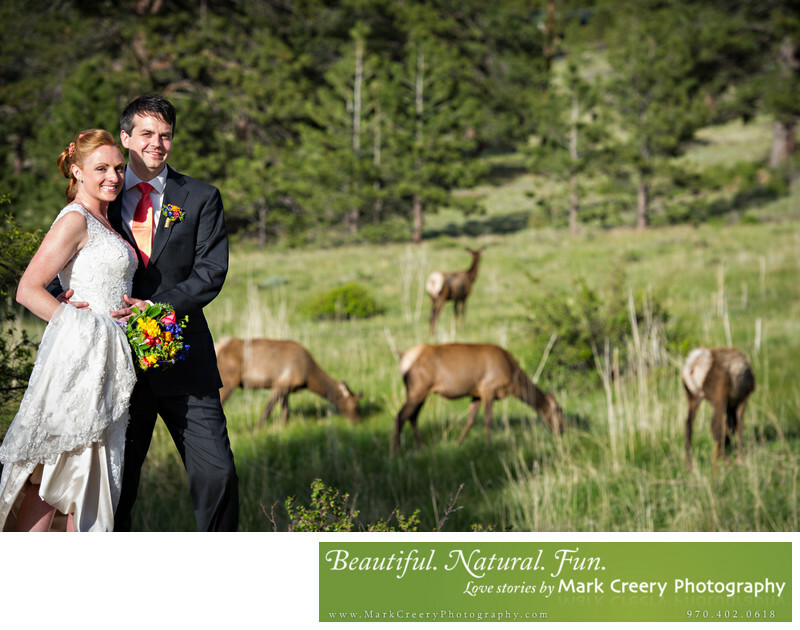 If you're lucky you could see some elk on the side of the road during your wedding photos like Katie and Brian did - at a safe distance, of course! Haley and Justin had an intimate ceremony overlooking Lily Lake in Rocky Mountain National Park. I love making sweeping high-res panoramic photos from scenes like this. Check out my panoramas page for more of one of my signatures. Moraine Park in Rocky Mountain National Park is a perfect spot for couples that are willing to walk a short distance for some outstanding views. Below, Lauren and Justin hiked with their trusty chacos and hiking books to the river's edge. I got down almost at water level to take this one to get a unique perspective and to make the landscape more prominent. Make sure you hire a professional photographer for your RMNP photos, as they need to have proper insurance and get the necessary permit to photograph in the park. See what other couples have said about my work on my reviews page. 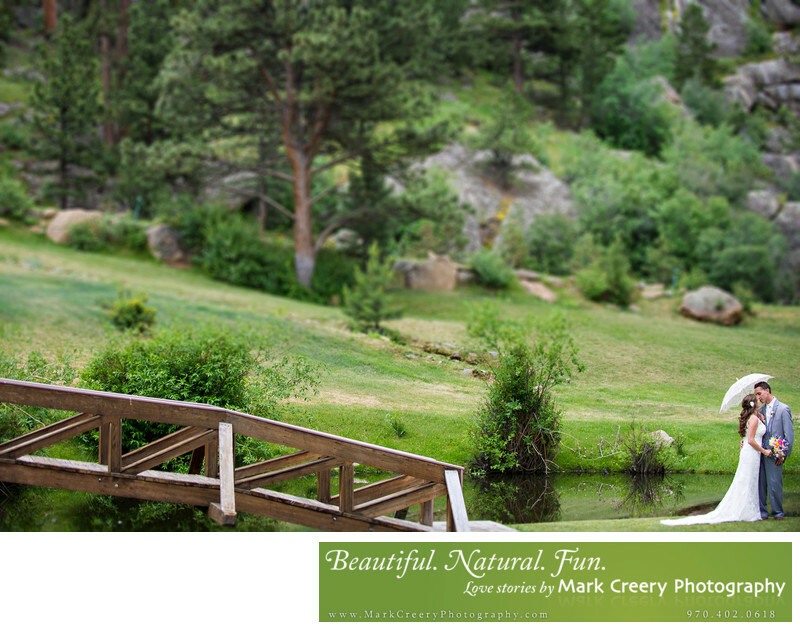 Estes Park, Colorado is a fantastic location for a wedding or elopement. It attracts brides from all over the U.S. looking for the perfect venue for a destination wedding. With the small town of Estes Park (or just 'Estes' as the locals call it) nestled among the peak of the Rockies and next to the world famous Rocky Mountain National Park there's no denying the charm and beauty that it offers. Only 6,000 people live here year-round, but the population swells in the summer to take advantage of all the area has to offer: hiking, biking, climbing, fishing, hunting, and the amazing wildlife to name a few. The weather is also very pleasant in the summer, often 10-20 degrees cooler than the hot Front Range with a fresh mountain breeze. Just beware of the afternoon thunderstorms that can sweep through the area quickly, especially if you're having an outdoor ceremony with no back-up. In that case try for a morning ceremony. Herds of elk just casually stroll through town, and have made an appearance in several of my wedding and engagement photos. The aspen colors in the Fall are really a sight to behold, and make a striking backdrop for photography. There is such a variety in the landscape, from sheer cliffs, huge boulders, pine trees, grass, lakes, rivers, creeks... you name it! This is my favorite location to photograph weddings and engagements since I really connect to the landscape and spirit of the area. 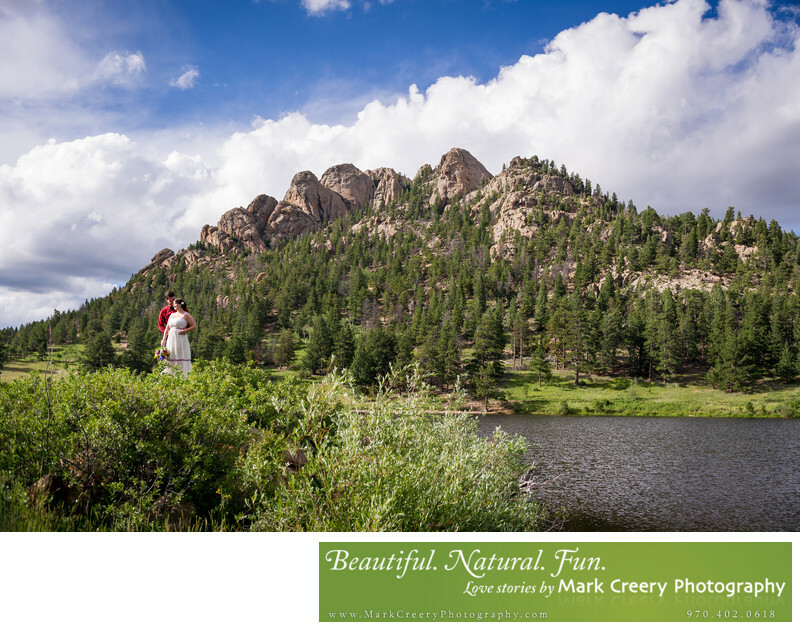 Great outdoor ceremony locations for a simple event include Lily Lake and Moraine Park Amphitheater in Rocky Mountain National, Hermit Park Open Space (which has it's own covered picnic area for a casual reception), and Sprague Lake (perfect for elopements). For a church weddings there is the YMCA and St. Bartholomew's Episcopal Church. Feel free to get in touch using my contact form. Thanks for checking out my site!